Mackay Transit Coaches has been operating School Services over many years and transports students to and from school safely each day. To view the full list of School Timetables and routes, please click here. Call our office to discuss school travel. Your school fares will be calculated based on your pick up and drop off locations. Send us a Quick Enquiry for more information on school bus zones and timetables. The Queensland Government offers assistance to some children using school bus services. The PDF below link will provide you with information to determine if your children are eligible for travel assistance. Please contact our office for more information on eligibility criteria and how to apply. 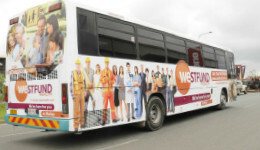 All eligible students travelling on Mackay Transit Coaches services must purchase a Smartcard to gain asses to the School Bus System; when completing their STATS application form. These electronic contactless cards have an imbedded electronic chips that verifies student eligibility each time they travel. Students who are not eligible and pay to travel may also purchase a smartcard and top up with money to use for bus trips. Please come in to our office to see how this may work for you. All students must abide by the Code of Conduct as set down by Queensland Transport. Please follow the link below to obtain a copy of the Code of Conduct.